Dr. François Sarrasin, a Frenchman, and a German named Professor Schultze are the sole heirs to a fortune of 525 million francs left by their mutual relative, a deceased Begum of India. With his half of the fortune, Dr. Sarrasin builds an ideal community called Frankville in the northwestern section of the United States. Professor Schultze uses his half of the money to construct his own city called Steeltown, where the main output of the city is weapons of destruction. Schultze’s real intent with Steeltown is to see to the destruction of Frankville. Translator: Stanford L. Luce. Introduction & Notes: Peter Schulman; Editor: Arthur Evans. Middletown, CT, Wesleyan University Press, 2005. 308 pages, ?? ill.
To begin to understand his narrative magic, simply call to mind any of the best known Verne titles, of more than 60: A Journey to the Center of the Earth (1864), Twenty Thousand Leagues Under the Sea (1869-70), Around the World in 80 Days (1873), The Mysterious Island (1874-75). These are all tales of marvels and monsters or eyewitness accounts of realms from which no traveler has ever returned, till now. Verne (1828-1905) lived through the great heyday of colonial expansion and global exploration. Back in Birmingham and Lyons, industry and technology were also busily developing new forms of transportation, communication and destruction. So Verne’s fiction neatly, imaginatively joined the wonders of geography to those of the foundry and the laboratory, without neglecting an enlivening breath of the sublime or the fantastic. Indeed, long before Hollywood discovered computer graphic imaging, the books of Jules Verne provided the 19th-century equivalent of industrial light and magic. Verne’s brisk, clear prose deftly mixed the real and the almost real, often by employing a fact-filled style that was sometimes journalistic, at other times scientific, but always replete with news items, historical events and leisurely descriptions of how things worked. As a result, the reader, especially the youthful [reader, not only marveled, “Can such things be?” but might also murmur, “I wonder if I could build one of those myself?” Little surprise, then, that Werner von Braun, Robert Goddard, astronaut James Lovell and many other pioneers of the space effort testify that From the Earth to the Moon (1865) first set their imaginations soaring upward. Still, Verne’s work has suffered three grievous literary misfortunes. First, it was badly translated into English, occasionally bowdlerized and sometimes actually rewritten. Second, it was largely relegated to the children’s bookshelf, even though Verne aimed for an audience of all ages. Third, much of the late and posthumously published fiction was written either entirely or in large part by Verne’s son Michel, who blithely signed his father’s lucrative name to the title page. Such cavalier publishing practices soon created the common image of Verne as a sloppy, tin-eared writer for the semi-literate. It probably didn’t help that he was also soon dubbed the father of science fiction (Mary Wollstonecraft Shelley being the mother). In fact, Verne’s books are more accurately what he himself called “novels of science,” and many are essentially realistic travelogues to distant lands, or even ludic, experimental texts (like the 1899 Will of an Eccentric, in which the human characters are all players in a kind of Monopoly game using the United States itself as the board. No wonder that some of the most innovative 20th-century writers, such as Raymond Roussel and Georges Perec, look to Verne as an inspiration). Several of the visionary writer’s more interesting later books even display despair over what science might do to the world, as much as for it. Certainly, The Begum’s Millions (1879) is best read as a cautionary political fable, part dystopian satire, part Dickensian social tract. Will this proto-Hitler succeed in his plans? Will he use his early version of the neutron bomb? Opposing him, Verne gives us Marcel Bruckmann, an Alsatian whose natal land is, after the Franco-Prussian War, under the dominion of Germany. But can this young Theseus even gain access to Stahlstadt’s inner sanctum, the Tower of the Bull, let alone slay its modern Minotaur? In The Begum’s Millions, Verne presents his first truly evil scientist. (Captain Nemo is a romantic anti-hero, with good reason for his depredations.) He also announces a theme that will recur in his subsequent fiction: the potentially dire effects of science on society. As early as the lighthearted Dr. Ox’s Experiment (1874), a callous researcher transforms a placid village into a raging cauldron of emotion by piping pure oxygen into homes and public buildings. Every feeling is intensified, metabolisms are sped up, and an opera that normally takes six hours to perform is zipped through in 18 minutes. In Master of the World (1904), the once relatively thoughtful hero of Robur the Conqueror (1886) returns as a megalomaniac who spreads shock and awe with his powerful battle station, a combination tank-plane-ship-submarine called, simply, The Terror. Finally, in The Barsac Mission (1919) -- announced as the last “Voyage Extraordinaire”—we are taken to a fortress city in Africa, from which a criminal mastermind uses the inventions of a brilliant, if blithely unaware scientist to wreak global havoc and mayhem. Jules’s increasingly pessimistic outlook. That despair reaches its acme in the famous short story, also by both Vernes, “The Eternal Adam” (1910): A scientist of the far future named Zartog Sofr-Ai-Sr is chastened to discover that archaeological evidence reveals that the men and women of the inconceivably distant past—that is, of our era—were intelligent, civilized and almost completely wiped out when the oceans suddenly rose and totally engulfed the continents. There is, concludes Zartog, no progress to history, only unending, senseless repetition. Like some other prolific writers (Alexandre Dumas, Jack London), Verne himself occasionally took over another man’s plot (duly paid for) and reworked it to fit his own obsessions and standards. Thus, The Begum’s Millions builds on a story originally drafted by a prolific hack named Andre Laurie (who eventually gave the memorial address at Verne’s funeral). All these and many other fascinating matters are discussed in the scholarly apparatus accompanying this handsome edition of this surprisingly dark (and prescient) novel: Peter Schulman’s introduction fills in the historical and interpretative background, while Stanford L. Luce’s “modern and corrected” translation is overseen by the eminent Verne authority Arthur B. Evans. 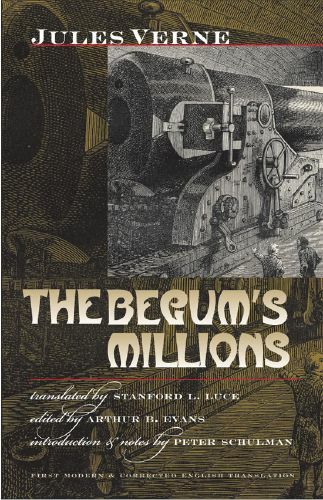 What’s more, The Begum’s Millions is only the latest offering in Wesleyan’s admirable “Early Classics of Science Fiction” series, which also includes Verne’s Mysterious Island and the less familiar Invasion of the Sea (1905) and The Mighty Orinoco (1898). To read Jules Verne is one of the great treats of childhood. To read Jules Verne later in life is to discover a writer just as satisfying but even richer, one who is not only a natural storyteller but also a mythmaker, a social critic and an innovative artist. In France, Verne is now studied as a major literary figure, and thanks to fresh translations—from Penguin and university presses at Indiana and Nebraska, as well as Wesleyan—more and more of his work is available to American readers in reliable texts. Give The Begum’s Millions or one of the other novels a try this winter. There’s a lot more to Jules Verne than what you find in those old, albeit quite wonderful, Disney movies. -- Review by Michael Dirda, Washington Post, Sunday, March 5, 2006; Page BW15.